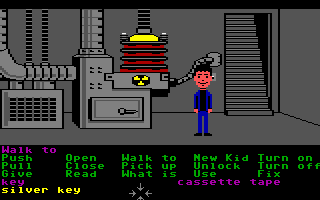 "SCUMM script was a little odd. When I first started designing the language, I was going to base it on Lisp. I was use to using it to customize emacs that we used to do all our coding. This was not on PCs, but on large multiuser UNIX machines. The Lucasfilm games group was part of the Lucasfilm computer division (which later became Pixar) and we had some very smart people that connected the C64 to the UNIX machine. From my UNIX terminal, I had complete control over the C64 and wrote a source level debugger for SCUMM. The 6502 assembler was custom written by Chip Morningstar and ran on the UNIX machine."